Packed with a large array of useful applications, the distribution runs entirely from RAM and can keep old and low-spec machines from turning into a paperweight. While it can be installed to disk, the project is perfectly at home providing persistent storage when running off a USB stick. If you like the idea of running distributions off RAM alone, also try Astrumi and Puppy Linux..
lot of distributions, especially niche projects such as firewall and pen-testing solutions, exist because the creators wanted a distribution that caters to their needs, and they found the existing offerings lacking. Quirky Linux was designed in 2013 for a different purpose: to continue pushing the Linux desktop metaphor. While initially an install-only project, Quirky is now available as an installable-Live environment that can also run off a USB drive or SD card. The 400MB ISO packs all the useful applications needed for everyday use, and gives you the option to either install it to disk, or to save your current live session onto the disk or USB stick, which you can then boot into later when needed. This makes Quirky a convenient portable distribution, with persistent storage. The installer gives you the choice of performing either a full or frugal installation. The former is the traditional installation to hard disk that all Linux distributions are capable of. With the latter option, all your settings and configuration will be stored onto a folder, whether on a disk, or USB drive. You’re greeted by the Quick Setup tool when you first boot into the live session. This single-stop application enables you to configure all the usual elements such as country, keyboard, timezone, as well as network settings. You can also set a hostname, enable the firewall, change the screen resolution and more. After you’ve configured your system, you can click the Save button on the Desktop to store the settings onto a remastered ISO or on your disk. On subsequent reboot, the system will automatically load the configuration from this stored file, so you won’t have to configure your system every time. When installing Quirky, you must use the Gparted utility to create a partition for it. Then click the Install button on the desktop to launch the installer, which leads you through a series of basic steps. Unfortunately, the distribution doesn’t install a boot loader, and instead insists that one must already be installed before you choose to commit Quirky to your hard disk. 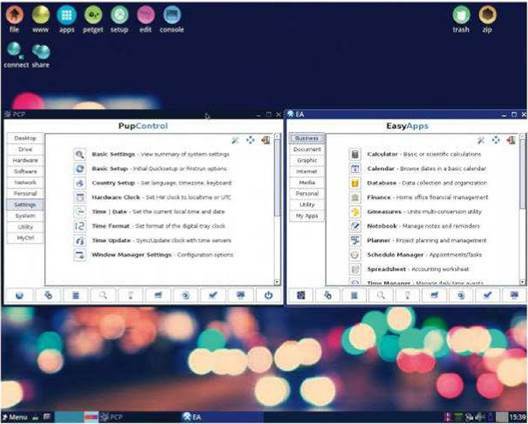 The desktop is peppered with icons such as file, www, apps, setup and so on, and you can use these to launch applications, and configuration utilities. The applications and setup buttons respectively launch the home-grown Easy Apps and PupControl utilities. We rarely come across such a well fleshed-out lightweight and ready-to-use distribution. But the inability to install a boot loader, is perplexing. Some might even call it… quirky! Unlike most other lightweight distributions, Quirky features the complete LibreOffice suite, and a large selection of applications. Best of all, it offers tools for encrypting files and storing passwords out of the box. Another useful and much needed utility is Pup Advert Blocker, which can be used to block all manners of ads on the default SeaMonkey browser, or any alternative you may install using the software manager. As Quirky is built from the latest DEB packages from Ubuntu 16.04.x series, you can use the PETget Package Manager to install additional applications from the software repositories. The choice of lightweight JWM and the stunning performance speeds make Quirky ideal for low-spec machines, but couple these with its default set of applications and there’s no reason why it can’t replace your existing distribution. While it may sit pretty on older machines, Quirky isn't any less than any of its bulkier and more popular peers.